Orthodox ideology is being rushed into the Russian school curriculum – in the interests of nationalism. It all happened very fast. In the middle of 2009 Dmitry Medvedev, the then president of Russia, said ‘Let it be’ and by September 2010 the Ministry of Education responded, ‘Thy will be done,’ and set up a pilot project to introduce religious and ethical studies in 19 Russian regions. The Ministry stressed that it was schoolchildren and their parents who would choose which of six modules they would study in their fourth year of school (10-11 year olds) – Fundamentals of Islam, Judaism, Buddhism, Orthodox Christianity, World Religious Cultures or Secular Ethics. Officials all over Russia explained that the new subject would help children develop their ethnic identity, moral sense and tolerance. Sceptics of course were not slow to point out that the choice of subjects was incompatible with tolerance from the start, including as it did three major world religions, but as regards the fourth, Christianity, it offered not a general overview but the study of only one branch. And this despite the fact that a survey by the All-Russian Public Opinion Research Centre showed that Catholics and Protestants, who are also Christians, make up about 1% of the Russian population, a similar figure to Jews and Buddhists. The pilot scheme was introduced in a great hurry, the syllabus just thrown together. A week before the regional pilot started, there were still no textbooks. The Talmud texts produced for the Jewish module by religious scholars were rejected by the Russian Academy of Sciences on the grounds that the course was designed as an introduction to a religious culture, not a grounding in dogma. But evidently this didn’t matter too much, and only a few changes were needed before they were given to the pupils. Nevertheless, after two years the pilot was officially pronounced a success (though in rather abstract terms). Yelena Nizienko, head of the Education Department of the Ministry for Education and Science announced that: ‘The new subject is a useful one – more than 60% of adults believe it has brought them closer to their children.’ After that there was no stopping it – no one asked the parents any more. And billions of roubles had already been spent on it, after all. So in 2012, ‘Fundamentals of Religious Cultures and Secular Ethics’ became part of the curriculum for 10-11 year olds. ‘The course has a clear denominational bias, whatever they say about its secular basis’. 2009, the year before the start of the pilot scheme, was the International Year of Astronomy. It was also the year when Astronomy was dropped from the Russian school curriculum, and the standard textbook used to teach it for twenty years lost its official certification. By the next year, everyone had forgotten about astronomy and was arguing about religion. Perhaps that’s why there was a rush to introduce it as a school subject? Galina Sarenko, head of the Geography department at Omsk Institute of Education’s tells me that the number of geography lessons in the school week is at its lowest for a century. Physics, Chemistry and Literature have also been cut to the bone, and Drawing has disappeared completely. At the same time the amount of information around is constantly expanding and becoming more chaotic, as textbook publishing has become a very profitable business. The main subjects taught in schools now are Personal Health and Wellness, Physical Education and Russian History. Parents’ persistent insistence on choosing the Secular Ethics over the Orthodox Culture module are a constant worry for the Church, which regularly complains about the pressure on families from schools. 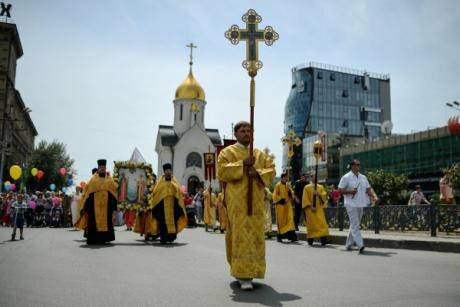 So the head of the Synodal Department for Religious Education and Instruction, Metropolitan Merkury has proposed not only lengthening the existing module, but including the Fundamentals of Orthodox Culture in Years 2-10 of the National Curriculum; and the Ministry for Education and Science has taken up his proposal, although it is not publicising this development. And for some reason, representatives of other faiths and denominations do not seem concerned. The media have been pushing the message that Russia can only be saved by a combination of piety and patriotism. But even before the Ministry took this decision, Merkury’s dream was already being put into practice in Crimea, where teachers are being trained to deliver the new syllabus, and textbooks have been hurriedly produced. The aim is evidently to ingratiate church leaders even further with the Kremlin by catching the mood of the moment. The introduction of Orthodox teaching into schools under the guise of ‘religious culture’ is not the first step in the recognition of the Church’s importance for Russia, but it is the most significant. The press and especially television has been pushing the message for some time now that Russia can only be saved by a combination of piety and patriotism, both of which are inextricably and exclusively linked to the Orthodox Church. In the regions church buildings are going up at an alarming rate – Leonid Polezhayev, Omsk’s regional governor for the last twenty years, has been building ten new churches a year even as the area’s industry and agriculture has totally collapsed. The Novosibirsk Region is lagging behind in this respect, having only managed 100 new places of worship in that time, but last year its then acting governor Vasily Yurchenko signed an agreement with Patriarch Kirill, head of the Russian Orthodox Church, to build another 100. At the same time, the government insists that this building spree is being entirely funded by donations from parishioners, and not out of hard-pressed regional budgets. This is hardly likely: the average monthly income of urban Siberians is a mere 26,000 roubles (£350), and for people in rural areas it’s only half as much. The Putin government is evidently intent on abolishing evolution in one country. Who needs people who can create their own worlds? We have our own Universe – Russia, a country where the Almighty above is in the service of the Almighty beneath.